We spent 25 hours researching and comparing 10 different car emergency kits and found that supplies included, quality of products included, and convenience were most important. The Lifeline AAA Premium Road Kit scored high above the rest in all categories and is our overall top pick. 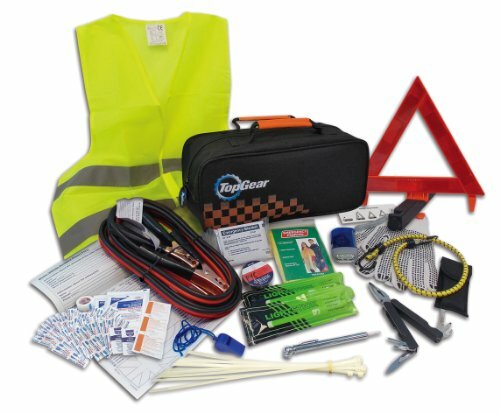 This all inclusive road emergency kit contains 42 crucial components that everyone needs in the event of an emergency with your vehicle. 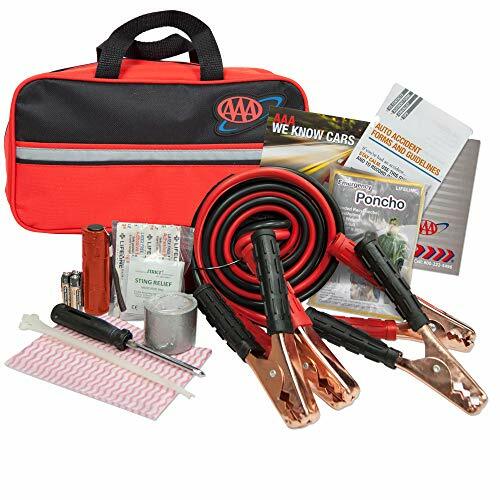 This valuable road kit is backed by AAA, the most well-known and trusted name in the automotive industry. Not only does it contain important items like zip ties, jumper cables, and a flashlight; it also has important first aid supplies as well. There are all kinds of things that can happen that could cause an automobile emergency: dead batteries, flat tires, car accidents, and inclement weather conditions can all be things that would require a car emergency kit. Situations like this are never planned and they can happen to the most careful and experienced drivers. Having the right kit in your vehicle that is packed with important items that you may need is a way to handle these unexpected occurrences with minimal frustration. It is being unprepared that causes additional stress and frustration. There are many car emergency kits on the market and some will be better equipped than others. Your objective is to purchase the right kit for your needs that contains equipment and items you will use and know how to use. The three reviews below are of popular, well-equipped car emergency kits that are stocked with all the things you would potentially need in an emergency. Any one of these three selections will work great as the emergency roadside kit for your vehicle. The Lifetime Premium Road Kit is backed by one of the most respected names in the automotive industry: AAA. 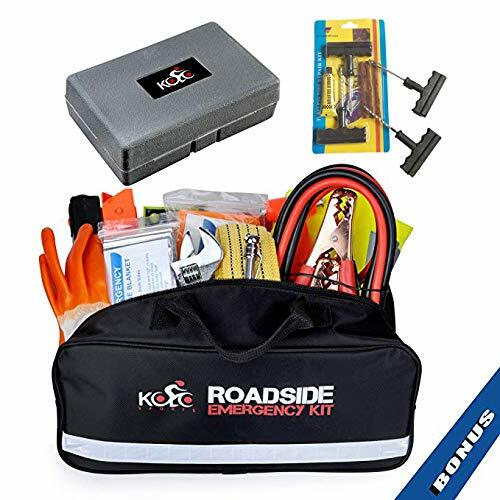 This exceptional kit includes what you will need in the event of an emergency while you are on the road including first aid supplies, jumper cables, and many other important items. You can be assured that with the AAA name backing it up, the items in the kit are items you will need and they are of the finest quality as well. This convenient kit works well for cars and trucks and fits easily in the trunk or behind the seat. All of the items in this car emergency kit fit into a quality bag so your emergency items are all in one place and easy to grab should you need them. Even the bag the items come in is made from premium, quality ingredients. This is not a cheap, flimsy emergency kit. There are 42 crucial components packed inside each bag. This basic level emergency kit has basic first aid supplies, a toolkit with duct tape, a screwdriver, zip ties and more, jumper cables, flashlight, road safety items and even a shop cloth. Another great choice for a quality car emergency kit is the Top Gear Premium Roadside Assistance Kit. The stylish Top Gear logo is on the front of the bag and closes with a zipper closure. Inside the bag is an array of essentials that you would potentially need in the event of an emergency including high quality jumper cables, a 14 function multi-tool that replaces many common tools and provides space for other items. This helpful tool includes wire cutters, flat and Phillips screwdriver heads, saw, ruler, file, 2 kinds of pliers and much more. It is a great way to have lots of tools at your fingertips without having to stock each tool separately. This great tool comes with its own carry case and has a belt loop onto the back of the case. Along with many road side emergency items like a warning triangle, there are gloves, electrical tape, light sticks, and a small first aid kit with needed items like gauze pads, antibiotic ointment, bandages, and cleansing wipes. The flash light and reflective safety vest add to the important and functional items that fill this useful emergency kit. The hand powered flashlight never needs batteries and works by squeezing the pump on the side of the device. It has a convenient strap for carrying and contains 3 LED bulbs for plenty of illumination when needed. There are many more items in the Top Gear roadside assistance kit that will be useful to you in a breakdown or accident including a rain poncho that measures 50” x 80” and has an attached hood, survival wrap that measures 52” x 84” and will provide protection from cold, a bungee cord measuring 18”, cable ties, tire pressure gauge with a whistle for getting passersby’s attention and accident report forms. Being prepared for an emergency is not wishing one onto yourself it is arming yourself with needed items so if anything does ever happen you are not scrambling to figure out what to do and how to handle things. The Kolo Sports Premium Auto Emergency is just the kit you need to handle a vehicle breakdown or minor accident. This useful kit has plenty of items that you will need in the event of a minor injury at the park or a breakdown in the rain. There are many roadside assistance tools including a warning triangle, jumper cables, seat cutters and window breakers and that is just the beginning. In addition to the roadside emergency items there are many first aid items that are a crucial part of a first aid kit including antiseptic wipes, gauze pads, first – aid tape and more. This massive 125 piece car emergency kit is your all-in-one solution for any emergency when you are away from home. Other important items you will receive in this kit include light sticks, a self-powered flashlight, tow rope, cable ties, bungee cords, tire pressure gauge, reflective safety vest and more. Kolo sport has even included a 25 pc tool set as a bonus that includes pliers and screwdrivers. These three top rated car emergency kits provide all of the items you could need in the event of an emergency away from home. These kits are convenient, self-contained in easy to transport cases, and have tons of things you could potentially need. Being prepared by having one of these kits in each vehicle you own is a great way to be ready for anything. Once you are ready to purchase a car emergency kit, choosing one of these all inclusive emergency kits is a great way to ensure that you have all the items you could potentially need such an emergency arise. These three selections are popular with car owners, have excellent feedback and reviews, and have all the items you could need plus more. Should one of these top three selections not meet your needs, we have provided a buying guide for your below that will help guide you on your search for one that has everything you are looking for so you can have everything you need in the event of a breakdown or emergency. There are many different kinds of car emergency kits on the market so make sure that you understand what you are looking for so you choose one that has everything you are looking for. Here are a few other great kits for you to consider. Whenever you are on the road driving anywhere whether it is long distance or local driving you are in a vulnerable position. You have to focus on your own driving and potential mechanical issues as well as worrying about what others in their vehicles are doing around you. This leaves you open to human error and unexpected problems that could result in you being stranded on the side of the road or injured in an accident. One of the best things you can do to be prepared for the unexpected is to have a car emergency kit in every vehicle you own. Many people use these kits for boats and RVs as well and some are even small enough to carry in a saddle bag on a motorcycle or when horseback riding out on trails. When choosing the right emergency kit for your vehicle there are some things you will want to take into consideration to ensure that you choose the one that fits the season, weather, condition of your vehicle and your driving patterns. If the region you live in does not have freezing rain or snow, there are some items you won’t need to worry about. It is very important to keep supplies available to keep your passengers and yourself fed, cared for in the event of an injury, and hydrated if there is ever a situation that results in you being stuck in your car for any reason. By being prepared with drinkable water, a first aid kit, and snacks you know that you and your passengers, especially if they are kids, will be okay until help arrives. The snacks you keep on hand in the vehicle should be kept separately, in your emergency kit and used for this purpose only not just for a child that is bored or having a day of misbehavior. Keeping the food for emergencies only ensures that you will have the supplies you need when you really need them. Good snacks to keep on hand for emergencies include foods that are high in calories, have a long shelf life so you don’t have to worry about the food going bad, and be easy to store. Having food and water in your vehicle for emergencies may sound unnecessary until you are stuck in your vehicle with little ones that are hungry, tired, and upset. Water is another critical supply to keep in your vehicle. Staying hydrated is important for everyone, especially little children. Being properly hydrated even during emergency situations will allow you to deal with the situation at hand much clearer and calmer. Look for water pouches which have a 3 years longer shelf life than bottled water and take up much less space. Last but not least is the first aid kit which needs to be stocked with antibiotic cream, bandages, pain relievers, and other supplies that are typically needed to handle common, minor injuries. Keep in mind that this is just the beginning when it comes to reasons having a car emergency kit is so beneficial. Now that you have read about the personal reasons emergency kits are so important and have an idea of the things you need to take care of you and any passengers you have riding with you, let’s go over the benefits of having automotive emergency supplies on hand. The main objective for having the right automotive supplies in your kit is to get your vehicle running again as quickly and safely as possible. Basics will include items like jumper cables or if you have the room a battery jump starter, all the equipment you need to change a tire, and other versatile supplies like multi-function tools, rope, duct tape, bungee cords, cable ties and other similar supplies that will help you get your vehicle up and going again. Don’t forget tools that you may need to work on your car such as pliers, screwdrivers, wrenches and other important tools. Since you could be working on your vehicle on the side of the road at all hours of the day or night, you will need to think about safety equipment too. This will be items like light sticks, flares, reflective vests, and reflective warning triangles. Being able to contact someone if you break down on the side of the road or have a minor accident is extremely important, especially if you can’t get your vehicle started again on your own. Walking to the closest gas station is not always an option especially if you have children in the vehicle with you or you have had an injury. If you have your own cell phone, consider having an extra emergency battery on hand in your emergency kit or a charger that doesn’t require an immediate power source. Another option is to have an emergency cell phone that is kept in the kit and is only used for emergencies should your own phone’s battery die. Another great item to have on hand is an emergency radio that does not require power from your vehicle such as a hand crank radio. This can be very beneficial in extreme weather conditions where you could be stuck in dangerous weather conditions. Even with all of these things in place if you don’t know how to change your tire or jump start your vehicle, those emergency items won’t do you much good unless someone stops to help. Make a point of learning basic emergency skills such as these mentioned and how to administer basic first aid and you will be ready to take care of your family, friends, yourself, or even a stranger in need. Many of the car emergency kits that are sold with items already stocked have looked at the most commonly needed things during an emergency or breakdown and they have added those to the kits. The three top rated kits we researched and found to be superior to other pre-made kits include all of the items that are most often needed plus more. The only thing that these pre-made kits don’t include is food and water and a few other items you can get on your own. Make sure you have a good place to store your emergency kit. The ones we have reviewed above have cases that the items are stored in but you can choose tubs, totes, or bags too if you prefer. Below we have listed out everything that should be in a well-stocked car emergency kit. Anything the pre-made kits don’t have you can add yourself and be fully prepared for any emergency that comes along. Each section will have items that work for specific circumstances so you understand how to use them and what situations dictate using them. First Aid Kit – Every vehicle needs a first aid kit. You never know when you will have a need for these supplies. Always having them on hand can prevent anxiousness from creeping it. Below are the things your first aid kit should have. If any of these items are not in the pre-made first aid kit, add them yourself. 1. Band-Aids – These are especially helpful if you have children. It is common to have a need for band- aids when you’re a parent. If you DO have kids, invest in some colorful Band-Aids that will take the sting out of their injuries. Don’t forget to choose several different sizes as well. 2. Gauze and medical tape – If you are dealing with a larger wound or just want to keep it covered until professional help comes, gauze and medical tape will come in handy. 3. Cleansing wipes & Antibiotic cream – Preventing infection is very important whenever there is a cut or scrape. Using the cleansing wipes and then applying antibiotic cream to any scratches, scrapes, or cuts before they are bandaged can prevent infection from starting. 4. Pain relievers – Keep a bottle of ibuprofen and a bottle of acetaminophen in your first aid kit for pain relief. Some pre-made kits will have little envelopes of pain relievers that are very convenient but the larger bottles work as well. 5. Ace Bandage – Ace bandages are very helpful for dealing with sprains. They can keep the area stabilized until you are able to get to professional help. 6. Tweezers – These useful first aid tools are just what you need for extracting splinters or when you need to remove any other kind of tiny thing that fingertips can’t grab, such as removing ticks while out camping. General Supplies – There are many things that you should have in your emergency kit that will help you get through being stranded or deal with an accident. Check your pre-made kit that you have chosen to see what items you may need to add, if any. 1. Flashlight – This is a really important item that will be a lifesaver if you are ever stranded or stuck at night. Look for flashlights that are self-powered so you don’t have to worry about stocking lots of batteries but it is not a bad idea to have at least one battery powered flashlight in the kit along with other non-battery powered devices. 2. Hand crank radio – If you are ever stuck on the side of the road, especially if it is during inclement weather and your battery is dead having the means to hear updates can be pretty critical. A good hand powered radio is a great addition to any emergency kit that will keep you up to date on what is going on. 3. Work gloves – This is a really good idea to have on hand to protect yourself or a passenger who may have to change a tire or clear debris out of the way. Having a good pair of protective gloves in your kit can prevent cuts and scrapes from occurring. 4. Disposable Poncho for Rain – If you are ever stuck out in bad weather for any amount of time it is very beneficial to have a rain poncho on hand. Look for one that has a hood and having reflective properties is always a good idea as well in the event you have to be out in the rain at night due to a break down or flat tire. 5. Blankets – There are a few different types of blankets that you can look at for your emergency kit. One is an emergency blanket, typically made of Mylar, that keeps your body heat in if you are ever stranded in a secluded area in cold weather. You can also use just regular camping blankets. If you routinely travel with your kids and you live in a snowy or cold region, have a few blankets so more than one person will have one if they need to keep warm. 6. Scissors – Scissors will always be a handy item to have in your emergency kit. They can be useful to cut bandages or other things that may need cutting. 7. Hand warmers – These incredible items can be a huge help against preventing frostbite. Having several of these in your emergency kit, especially if you live in a colder region where ice storms and snow can be prevalent. Hand warmers are convenient and easy to use. 8. Batteries – Batteries are very important for a number of items in your kit. You want to make sure you have batteries for your flashlight for starters. If your radio isn’t hand crank or if it has a battery capability in addition to being hand cranked, you will need to have a set of those batteries on hand. 9. Cable Ties – You never know what these great little things can be used for but cable ties, also known as zip ties can be very helpful to keep things together until you can get to safety. 10. Items for the kids – If you have children, you should consider adding a few things to keep them busy in the event of a breakdown such as coloring supplies, travel games, and books. It does not have to be a lot of things but if you can give them something to keep their minds off of being stuck in the vehicle it can help alleviate their worries or boredom. Automotive Supplies – Last but in no way least are the automotive supplies that need to be in your emergency kit. These are items that have to specifically do with your vehicle. 1. Jumper cables – Jumper cables will come in handy of you or anyone else is dealing with a simple dead battery. Even if the battery is bad being able to attempt to jump start it with any strangers that may happen along your path can help you get your vehicle started so you can get it to a garage. 2. Tire Sealant – In the event of a flat tire, it is always beneficial to have a can of tire sealant on hand. Even if you have a good spare, it’s not always safe or possible to change the tire. Using tire sealant can allow you to get to safety and a garage where you can get the tire changed if necessary or plugged if the problem isn’t too bad. 3. Fire Extinguisher – This very important item can be small enough to carry in your car and is very helpful in the event of an engine fire. Make sure whatever type of fire extinguisher you get, that it is rated to be used on automobiles for electrical fires. 4. Ice Scraper – This is an important item to have should emergency help be required so you can scrape ice and/or snow from your windshield and keeping it cleared. 5. Snow Shovel – Cold winter climates make it important to carry a snow shovel in the trunk as well. It is a very convenient and helpful tool to have because at some point. 6. Warning reflectors or Flares – If you are broken down on the side of the road or in the middle of the road and can’t get the car to safety it is very important that you ensure other drivers and oncoming traffic can see you. Have enough reflective warning triangles or flares to set up around the vehicle. They should be set up in the following manner: one 15 feet behind the car, one 15 feet in front of the car and any remaining ones can be set up in increments of 30 feet each behind the vehicle. Alerting traffic where you are and that you are broken down will help prevent an additional accident or emergency that can happen if someone runs into you due to not seeing you were stopped. 7. Tow rope or chain – keep a rope that has a pulling capacity of 6000 pounds or more in the vehicle in case you ever need to be towed or tow someone else. 8. Tool box – Keep a small tool box with numerous important tools in it that you may need if your vehicle breaks down. These will include a wrench, hammer, screwdrivers (flat and Phillips), pliers, bolt cutters, seat cutters, window breakers, and if you want to spend a little more, have a good ratchet set on hand as well. 9. Portable air compressor – If you have some extra to spend you may want to seriously consider getting a portable air compressor. This helpful piece of equipment can inflate your tires if you have a flat while driving. If you don’t know how to change a tire the combination of the tire sealant and the air compressor can get you back home or to the garage safely. These air compressors are not very expensive and are well worth their cost to have the ability to inflate your own tires. Pre-made car emergency kits like the three top rated choices we have featured above provide you with an easy, convenient way to supply your vehicle with the items you could potentially need during an emergency or breakdown. Being prepared is the best way to handle these unexpected situations safely. The information in this guide gives you a breakdown of what a well-stocked emergency kit should contain so once you have chosen one of the premade kits on the market you can use the helpful list we have given you to add to the pre-made kit so you are thoroughly protected for any unforeseen situation. The pre-made car emergency kits will save you a lot of money and will contain the majority of what you need. The items you can add that may not be in your kits are your choice, but will prepare you for breakdowns, flat tires, accidents, and situations caused by inclement weather. When you are properly prepared for an emergency you will be able to take care of your kids, family, and yourself without panic or fear.